The latest Bank Indonesia consumer survey revealed that the Consumer Confidence Index (CCI) improved in November of 2018, scoring from 122.7 to 127.0. Indonesia’s finance ministry sold 8.655 trillion rupiah ($611.88 million) of Islamic bonds at an auction on Tuesday, above the indicative target of 8 trillion rupiah, its financing and risk management office said. Do you think Prabowo has a shot at overcoming Jokowi’s lead with just about 3 months left before the election? Indonesia will dip further into Islamic sovereign bond sales this year to fund infrastructure projects, relying less on global investors and expediting a deepening of its financial markets. The Finance Ministry is considering a reduction in the tariff of income tax on corporate taxpayers to improve the competitive edge of the national industry. President Joko Widodo (Jokowi) has stated that traffic congestion in and around Jakarta has inflicted some Rp65 trillion in losses per year. The Royal Malaysian Police (PDRM) will boost the security at the Malaysian border between Sarawak and Indonesia following the kidnap of five people in the jungle near Kampung Danau Melikin, Dec 11 by the Indonesian security forces. Three fatal disasters in succession could have been a gift for Prabawo Subianto, the Indonesian former lieutenant general, who is challenging President Joko Widodo in this year’s presidential election. AS MADELEINE Albright wrote in her brilliant take on the rise of authoritarian regimes, Fascism: A Warning, the Italian dictator Mussolini was once quoted as saying that when accumulating power it is best to do so as one would pluck a chicken – feather by feather – “so each squawk is heard apart from every other and the whole process is kept as muted as possible”. The Indonesian government is considering to apply tobin tax on foreign capitals, a move aiming at encouraging foreign capitals to park in a longer period in the country, Finance Minister Sri Mulyani Indrawati said on Tuesday. 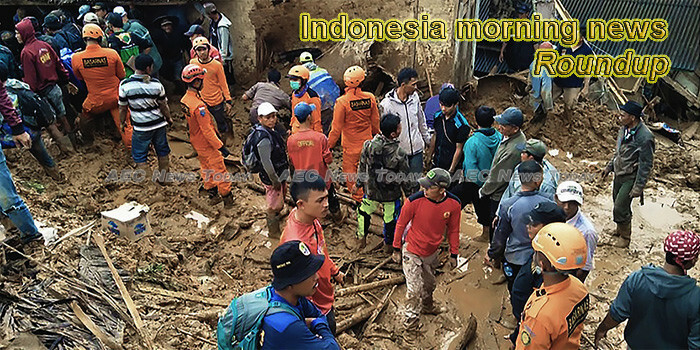 ndonesia will more than double its disaster response budget to 15 trillion rupiah ($1.06 billion) in 2019, officials said on Tuesday, after a series of major natural disasters devastated three regions of the vast archipelago last year. Finance Minister Sri Mulyani denied the allegation saying that the two-fold increase of social funds or locally known Bansos was related to the election in April 2019. She opined the hike was set considering the amount of the assistance had never been raised since 2012. Despite challenging circumstances that trigger capital outflows from emerging markets – mostly related to the ongoing tariff war between the United States and China, monetary tightening in developed nations, US President Donald Trump’s unpredictable style of leadership, and rising crude oil prices in the first three quarters of the year (that cause pressure on net oil importers) – Indonesia ended 2018 in good financial health. An earthquake with a revised magnitude of 6.6 has struck 174km north-northwest of the city of Ternate in Indonesia’s Molucca islands, but there is thought to be no tsunami risk. When Indonesian authorities seized a notorious fishing boat last April carrying 30 kilometers (18 miles) of illegal gillnets, they found they had essentially caught a ghost. After a steep correction last year and pressure on the rupiah, Indonesia expects stability to return to its financial markets this year as foreign capital starts flowing back into the domestic market. The Health Ministry has promised to continue with measles-rubella (MR) vaccinations after a nationwide immunization drive officially ended on Tuesday. Foreign Affairs Minister Retno L. P. Marsudi has called for reduction of plastic waste by using refillable bottles and reusable straws and bags. KinerjaPay Corp., a Delaware corporation (OTCQB: KPAY), a digital payment and e-commerce platform, (“KinerjaPay” or the “Company”) announced that it has received a signed commitment from PT. Investa Wahana Group, Indonesia to invest $200 million, subscribing for $100 million in shares of the Company’s Series F and an addition $100 million in shares of the Company’s Series G Convertible Preferred Stock. India is exploring the possibility of selling the BrahMos cruise missile to Indonesia, and a team from the Indo-Russian joint venture that makes the weapon system visited a state-run shipyard in Surabaya last year to assess the fitting of the missile on Indonesian warships, people familiar with developments said. The National Police has arrested a suspected creator of hoax news on seven containers of cast ballots for the presidential election in April 2019. Lion Air has not yet imposed its paid baggage policy which was planned to take effect today, January 8, following an order from Air Transportation Directorate General of Transportation Ministry that the low-cost carrier must conduct dissemination on the new rule to the public. West Pasaman District in West Sumatra Province is organizing the first Mount Talamau Coffee Festival on Jan 7-10, 2018, to promote locally grown coffee internationally. he US-China trade war is beneficial to Indonesia as it could lead to a shift in production to other countries in the region, according to Indonesian Vice-President Jusuf Kalla. The official Twitter account of the Energy and Mineral Resources Ministry was flooded with angry comments on Tuesday after it gave a tone-deaf response to a Twitter user’s complaint about a power outage. The alleged prostitution case involving national actresses has become public limelight. The National Commission of Anti-Violence Against Women (Komnas Perempuan) considered it as a deviant case. Trade Minister Enggartiasto Lukita said he has promoted the domestic rattan industry to grow further in accordance with President Joko Widodo`s directive. Indonesian politics in the past year was dominated by one major dynamic: manoeuvring and positioning in preparation for impending elections. In April 2019, Indonesia will hold its fifth national elections since the country initiated the transition to democracy in 1998.